Subaru has revealed the Levorg concept at the Tokyo Motor Show. 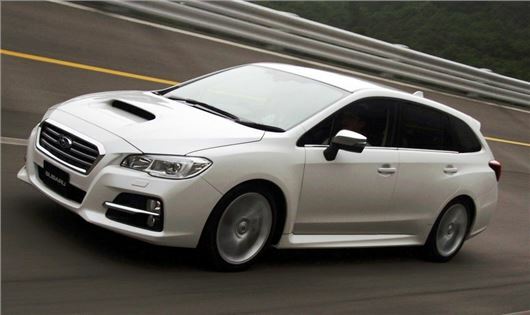 It’s designed to preview the next generation Legacy Touring model, due on sale in Japan in 2014. Given the similarity between the concept and production versions of the latest WRX model there’s a good chance the next Legacy will look almost identical to the car pictured. UK on sale dates for the next Legacy are to be confirmed, but it’ll likely be 2015 at the earliest. The Levorg shares styling details with the recently revealed WRX, with ‘hawkeye’ headlights and a hexagonal grille, but it doesn’t look massively different to the current generation Legacy Tourer, with a similar silhouette. It has been engineered to take either a 1.6-litre Boxer petrol with 168PS or a 2.0-litre Boxer petrol with 296PS. Japanese buyers prefer petrol engines but there’s no reason a diesel couldn’t be installed. The Levorg features up to date safety gear including hazard assistance to help steer the car if an obstacle is detected and active cruise control. There’s also a system to prevent unintended, sudden applications of the throttle when the car is in reverse – a problem that tends to affect cars with automatic transmission more than those with manual gearboxes.